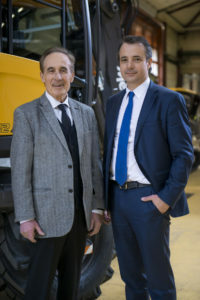 A meeting with Alexandre and Henri Marchetta, CEO and Chairman of the MECALAC Group respectively, to talk about their vision of urban work sites and the new products to be discovered at the Mecalac 2,700 m² stand at BAUMA 2019. Your machines’ architecture continuously evolves with that of urban work sites. How do you see your core business today? ALEXANDRE MARCHETTA: If I had to characterize the evolution of today’s cities, I would say “increasing density and regeneration”. At urban job sites, space is always more restricted and manoeuvering options are reduced. The performance and profitability demands are always increasing. Moreover, work sites come with noise, discomfort and pollution that must be minimized or eliminated. For more than 40 years, Mecalac has supported these urban work sites, whose demands are getting ever more complex. The architecture of our machines evolves with this equation, anticipates new standards, the expectations of residents and those of owners and contractors. We proceed with conviction toward greater versatility, compactness, human safety and respect for the environment. It’s our mission and our passion. This year at Bauma, we are proud to present — in addition to our lines of excavators, loaders, backhoe loaders, compaction rollers and site dumpers — some brand new machines and accessories whose main purpose is still the optimal management of urban work sites today and tomorrow. You’re revealing a lot of new things at BAUMA 2019. You’re still innovating and still relevant. How do you do it? AM: We have always given research and development central importance, and we concentrate on four main pillars: safety, ease of use, performance and integration. We design and improve machines by systematically including technology indispensable to changes in regulations, work habits, safety, comfort and the environment. We have also built the history of Mecalac on stability of the relationships with everyone we deal with: suppliers, distributors, buyers, users, collaborators, etc. It’s an essential dimension of our business model. This close relationship with all stakeholders allows us to listen to the end users — the drivers. This closeness gives us food for thought on how to optimize our machines and offer relevant innovation. Your very complete offering is tightly bound with your international growth, which has taken on new magnitude in recent years. Tell us your vision for the group and its future. AM: Innovation is in our DNA. Knowing our customers’ jobs, listening, talking with various people in construction and public works is the key to our development. We strongly believe in meeting the precise expectations of every profession and every country. Because every job has its constraints, every country has its culture; we build machines that respect these differences while integrating the essential elements, such as the safety of people at the site and the overall ergonomics of our machines. We want to support urban work sites in every country. Our historical markets in the heart of Europe have promoted our growth and brand history and continue to be a fundamental pillar for MECALAC and a source of inspiration for our R&D. But not all markets move in the same direction. Some demand solutions that reflect a different vision of urban work sites. In this sense, our new production unit, Mecalac Construction Equipment UK, perfectly rounds off our global offering. As you can see, the MECALAC Group’s vision and its future are based on differentiating the response, whatever the country. Australia and the United States have opened up to MECALAC with the MCR concept. In Russia and North Western Africa there is demand for our backhoe loaders. At Mecalac, rental companies of every type can find a growing machine range, from wheeled or crawler excavators, dumpers, compactors and loaders. Today, Mecalac’s product line includes 59 different machines and just as many responses to urban work sites anywhere in the world. Right now we’re in Munich for BAUMA — what is your growth goal for Germany? 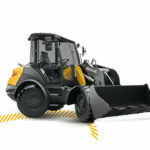 AM: Germany is a strategic market for the MECALAC Group, a collaboration that started with MECALAC wheeled loaders, 100% made in Germany since 1952. The plant at Büdelsdorf, near Hamburg, became a MECALAC Group subsidiary in 2002. It was a choice for expanding our offering of innovative products in the common trade segments (such as construction, laying cables and sewers, highways, green spaces and local communities). It was also made for growing and strengthening our European position. Today our SWING line of loaders, our MCR crawler excavators, our MWR wheeled excavators and our site dumpers are especially suitable to the demands, expectations and needs of German businesses. It is up to us to make this known at this trade show, and beyond that, across our German dealer network, which now has 26 distributors. HENRI MARCHETTA: Our choice of international developments has always been decided by a long-term vision organized around the person and the product. We remain entrepreneurs who listen, seekers of simplicity and relevance everywhere, people who are true to our vision and values. I continue to support and watch this company, which I’m proud of and cherish. We were an SME, and now we’re an international group. I remain deeply attached to its human values, the harmony of its expansion, the quality and relevance of each new design, and the way we listen to our dealers and end customers. We must preserve these values and be sure to continue to communicate this message. I find it a privilege to witness this history and to see that the passion and incredible taste for adventure born here in the heart of the French Alps are still intact. MECALAC. “Mécanique du Lac” retains its soul and humanity, synonyms of progress and future. ALEXANDRE MARCHETTA: As my father has perfectly expressed, the future needs roots, and ours are deeply anchored in the relational quality and the sustainability of our values. We continue paying attention to this world of movement, and to bring future solutions — machines that are always versatile, compact and respectful of people and the environment. It is our greatest strength, and certainly the force behind our growth.